As parents – and referees – of eight children, we have survived personality clashes, ability battles, attention tactics, and multiple mini-battles, only to conclude that sibling rivalry, like nightwaking, is one of the inevitable annoyances of having children. We also learned that the degree of sibling rivalry, and whether or not it has long-term positive or negative consequences, depends on what parents do about it. Yet, out-of-control sibling rivalry should not be considered an unavoidable consequence of having more than one child. Our first two children, Jimmy and Bobby, were born twenty-six months apart and began the competing roles of the usual close-in-age sibs. As preschoolers they fought over toys; as middle-schoolers they competed over grades; as young teens they vied for friends. When Jim was the first to get married, bridegroom Bob commented, “No fair!” (Bob went on to father the first grandchild – at last he did something first!) Years later these rivaling sibs are now close friends and partners in pediatric practice as Dr. Jim and Dr. Bob (along with their dad, Dr. Bill). Many kids ago we realized that part of discipline is doing what we needed to do to like living with our children. High on our list was both promoting sibling harmony and discouraging sibling rivalry. Here are 20 ways that we learned to help our children be friends with each other before they learned to fight with each other. 1. Make friends before birth. 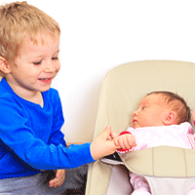 Get your older child acquainted with the new baby before birth. Show her pictures of a baby growing in mommy’s belly. Let her pat the baby beneath the bulge, talk to baby, and feel baby kick. Replay the older child’s babyhood. Sit down with your child and page through her baby photo album. Show her what she looked like right after birth, coming home from the hospital, nursing, and having her diaper changed. By replaying the older child’s baby events, she will be prepared for a replay of her brother or sister. 3. Time share. What bothers children most is sharing you with the new baby. Since the concept of sharing is foreign to the child under three (as mom is their most important “possession”), it’s unlikely that you’ll be able to sell the child on the concept of sharing mother. It sounds good to say that you’ll give your older child equal amounts of your time, but in practice that’s unrealistic and unnecessary. New babies require a lot of maintenance, and you don’t have 200 percent of yourself to give. We would wear our infant in a baby sling, which gave us two free hands to play a game with the older one. While feeding baby, we would read a book to the sibling, or just have cuddle time. Spending a lot of time sitting on the floor increases your availability to your toddler while your baby is in-arms or at breast. As baby gets older, place him in an infant seat, or on a blanket, on the floor to watch you play one-on-one with her big brother or sister. This entertains two kids with one parent. As first-time parents, we struggled with how we were going to meet the needs of a newborn and a toddler, only to realize that because our toddler got what he needed as a baby, he could handle frustration. An infant can’t. 4. Stay positive. Promoting sibling harmony requires a bit of parental marketing. You may think that your older child should be thrilled to have gained a live-in friend, but children are often preoccupied with what they’ve lost. They’re not so keen on sharing their toys, their room, and most importantly, their parents with someone else. Turn this around to help the normally egocentric child to imagine, “what’s in it for me?” Use the term “special time.” (You’ll get a lot of marketing mileage out of the word “special.”) The attention your child apparently has lost from mom, he gains from dad. Arrange a lot of one-on-one outings for your older child, such as time at the park and the ice cream store, so the child realizes that even though he’s lost some time with mom, he’s gets more special time with dad, grandparents, or other caregivers. 5. Begin the day in harmony. If possible, start most days with “special time” with your toddler. Sometimes starting the day with twenty minutes of intensive care—holding time—with your toddler can ward off angry feelings in the toddler toward the new baby and is a good investment in the rest of the day. Sib in charge. If your children are several years apart, give the older child some supervised responsibility for the younger one. This will motivate the older brother or sister to care, and the younger sib will sense this. Even a toddler can gently hold and pat the tiny baby under supervision. Sib as comforter. When one child was hurt, we would ask one of our other children to help attend to the injury. We would give our assistant a job title: “Dr. Erin, you hold Matthew’s leg while I wrap it” or “Please put the bandage on Lauren’s cut.” The “doctor” would most likely muster up compassion for the “patient.” It’s hard to hate the hand that comforts you. Sib as minister. In our family, if one child was either physically or emotionally hurt, the others were encouraged to offer comfort to ease the pain. We called this practice “laying on of hands.” The sib under pressure (whether it be an upcoming test, or an emotional or physical hurt) would sit in the middle of the group while the rest of us would place a hand on him and pray for his comfort in a calming way. When our seventh child, Stephen, was born, we saw very little sibling rivalry between the rest of the children. Because Stephen was born with Down Syndrome, our children soon learned – because they were taught – that Stephen had special needs and he needed a special kind of brotherly and sisterly love. Sib as teacher. Encourage your child to teach a skill he is proficient at to his sibling. For example, we got our son Matthew, an avid baseball player, to show his brother Stephen how to hit and catch a ball. And now, years later, Stephen can play ball well with typical boys his age. Sibs as co-workers. Assign children tasks that require cooperation and motivate them to work together: “Matthew, would you and Erin please clean up the garage? If you two hurry, we can finish soon enough to catch an afternoon movie!” If the siblings are born with clashing personalities, the adult monitor should keep a “bossy-submissive” relationship from developing. Sibs as co-sleepers. Parents in our practice have told us that children who sleep together at night usually play more peacefully together during the day. That has also been our experience. Sib as entertainer. If you have a born clown, capitalize on that asset and encourage the clown to entertain the other sibling, such as the older child humoring the toddler while you get something done. 7. Set limits. Sometimes you’re too tired to play amateur psychologist and you just want to click into your police mode. Do it and don’t worry about permanently damaging your child’s psyche. Give clear messages about how you expect your kids to behave toward one another before arguments become a way of life. Offer calm verbal reminders: “That’s a put-down,” as one sib belittles the other. Or, issue a look that says “don’t even think about it!” Head off fights at the first squabble, before they get out of hand. Be watchful for aggressor- victim roles. Your job is to protect your children, even from one another. How siblings behave toward one another is their first social lesson in how to behave in a group. In our family, we have set certain “maximum allowable limits”, which are behaviors that we insist upon to like living with our children, and the children are taught to respect these. When bickering and toy squabbles have reached intolerable decibels, Martha simply announces, “That’s disturbing my peace.” The children have learned – because they have been taught – that this means the limits have been reached and more socially-acceptable behavior must follow. 8. Hold family meetings. Hayden was the first girl in our family after three boys. Even though we thought the teasing was good-natured, Hayden didn’t always see it that way. One day when she was five, she told us, “No one in this family loves me.” We held a family meeting to prick a few consciences. The boys and Hayden thereafter became better friends. 9. Humor is the best medicine. Our five-year-old, Peter, holding some strands of hair in his hands, came running to the kitchen complaining about his two-year-old sister: “Hayden pulled a bunch of my hair out.” Catching Peter by surprise, Martha suggested, “Why don’t you take your hair to school for show and tell.” Peter thought this was such a funny idea that he forgot about the hair-puller. One day when Jim and Bob’s toy squabbles exceeded our family’s tolerable limits, I told them, “If you two want to fight like animals, I’ll build cages for you in the backyard. I’ll call one of you a cat and one of you a dog. I’ll put out a little cat food for one and dog food for the other…” Veteran pet owners have long learned that even cats and dogs can be taught to live harmoniously together if the owner sets house rules and sets up the relationship as friends. Humor disarms and catches children by surprise, so that they can see how insensitive their actions are toward one another. 10. Foster a team spirit. We often took our children with us on family trips. They soon learned that with privileges come responsibilities, so they learned how to act in a group. The home and family is the first social relationship that kids learn. They learned how people treat people and that everyone in that group has individual rights. They developed a group sensitivity, which is an important tool for life. In fact, disciplining siblings is really giving them the tools to succeed in life. One time we took our eight children (and two grandchildren and their mothers!) with us when we chartered a sailboat in the Caribbean. In this situation, the children had to get along and work together (for safety and for sanity). 11. Promote empathy. Disciplining siblings is giving them the tools to succeed in life, and one of the most important tools that has life-long social implications is the quality of empathy. This is another way of stating the Golden Rule – “Do unto others as you would have them do unto you.” Help your children learn how to get behind the eyes of another person and think first how their behavior is going to affect that other person. We want our children to think through what they’re about to do. A lack of empathy is the hallmark of sociopathic relationships between adult siblings. 13. Ignore smallies; address biggies. For smallies, such as toy squabbles, teach children to handle it themselves. Simply state the consequences and what you expect, “I’ll be back in one minute. If you kids haven’t learned how to share the toy or work it out, the toy goes in the garage.” You can either time-out the toy or time-out the kids. You’re giving them two messages: you expect them to be able to work it out themselves, but you’re giving them the unequivocal consequences that if they don’t, you will. Children expect parental guidance, as if wanting adults to protect them from being like, well, kids. Biggies are put-downs, or one child victimizing the other. In these situations, children need you to monitor put-downs. If you don’t, you’re not doing your job. By remaining silent, the victim concludes you’re siding with the victimizer. Some sibling squabbles seem to be a right of passage. Children practice on each other, especially when they’re bored. They feel, “We need some action here. Let’s stir things up.” This can lead to the older child goading the younger one, though oftentimes the younger sib becomes the pest and instigator, as if child number two has to try just a little harder. 14. Children do not have to be treated equally. While children are created equally, it’s impossible to treat them that way all the time. It took us several children to discover this fact of large family life. In their desire to prevent sibling squabbles, parents strive to do everything the same way for all their children, whether it’s buying pajamas or selecting a college. Children aren’t the same; you don’t need to behave as if they were. Make moment-by-moment decisions and don’t worry about the long-term consequences if you give one child more strokes than the other one day. Shoot for a balanced week, not a balanced day. “Why did Hayden get a new pair of shoes and I didn’t?” quibbled Erin. “Because hers were worn out and you got a new pair of shoes last month.” Yet, we didn’t let Hayden flaunt her prize in front of Erin. Children want to be treated individually, not equally. Yet, children have an innate sense of fairness, or what they perceive as being fair. Some children are born scorekeepers. If you try to join the game, it will drive you nuts. One evening at dinner two of our score- keeping children counted the number of peas they had been served to be sure they got an equal number. After that, we let them serve themselves. If they wanted to go through this ridiculous exercise, that was their choice, but we weren’t going to join in this draining game. If a treat needs to be divided, we let one child divide the treat, while the other one gets first choice. As much as you can, try to divide chores equally among children according to their ages and capabilities, yet don’t beat yourself up trying to be 100 percent fair. You can’t be. Remember, you are preparing your children for life, and life does not treat people fairly and equally. “Daddy, why do I have to go to bed at 9:00 o’clock when Erin gets to stay up until 10 o’clock?” “Because you need more sleep.” Children don’t seem to grumble when they sense the fairness of your decisions. Explain that children get different privileges and more responsibilities as they get older. They can look forward to growing up. Sometimes group therapy solves the equal-time drama. If we gave every child in our family equal time for a story at bedtime, we’d be reading all night. The older ones soon learn that the younger ones need more nighttime parenting to get them to sleep. If they want the same, they join the family bedtime story. Oftentimes, we would have several kids around the bed to join in the three-year-old’s story. 15. Every child is a favorite. It’s unrealistic for parents to claim they never play favorites. Some parents’ and some childrens’ personalities clash; others mesh. Some children bring out the best in their parents; others push the wrong buttons. The key is to not let your children perceive this as favoritism. Better yet, make them all feel special. If your child asks you a question, “Who do you love more – me or Matthew?” give the politically correct answer – “I love you both in special ways.” Give the comparison that love is like sunshine – sharing the sun doesn’t mean you get less, and our love shines on our children like sunshine. Mention special qualities: “You are my firstborn, and no one else can be my firstborn child” (or second, or first daughter, etc.). Don’t fall into the “who’s best” trap. Children don’t expect you to say who’s better, they are only fishing for reassurance about how you feel about them. 17. Referee quarrels. When to step in as a referee and when to remain a bystander is a round-by-round judgment call. Sometimes letting children be children or giving them reminders is all that is necessary. Martha’s immediate fight-stopper is “You’re disturbing my peace.” This works because we have already planted the idea that in crowds (our family qualifies as a crowd) one respects the peace of others. If children are in danger of hurting someone or damaging property, stop the fight. Siblings who are allowed to fight as kids are more likely to fight as adults. Above all, stop sibling abuse – either physical or emotional. 18. When in doubt, intervene. You may hear, “Oh, they’ll just grow out of it!” Both experience and research has shown that without parental guidance, siblings with bad relationships are likely to grow into adults with bad relationships. The more they are allowed to fight as kids, the more likely they are to fight as adults. Being complacent and concluding that the childhood relationship will naturally grow from sour to sweet is being naïve. It doesn’t. The relationship is likely to get more sour when children grow up being deprived of the brotherly and sisterly love that is the birthright of being a brother or sister. 19. Listen to both sides. Children will be both buddies and battlers. We not only need to protect growing bodies from physical abuse, which siblings usually grow out of with few or no lasting scars, but more importantly we need to protect their absorbing minds against emotional abuse —which is more likely to have life-long consequences. Sibling abuse is not to be tolerated. If danger is apparent, remember safety first and psychology second. First, separate the fighters; then instead of being drawn into the shouting match, calm everyone down and put on your home psychology hat on top of your authority hat.